In an article for print headlined M.T.A. 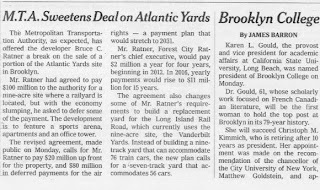 Sweetens Deal on Atlantic Yards, the New York Times reduces the MTA's complex--and, to some, outrage-generating--deal with Forest CIty Ratner to five bland paragraphs. It's contemptible. Nearly everyone else did a better job. The Times reports the bare outline: that the deal has been revised from $100 million to $20 million up front and the equivalent of $80 million deferred. It also "changes some of Mr. Ratner’s requirements to build a replacement yard for the Long Island Rail Road" from "a nine-track yard that can accommodate 76 train cars [to]... a seven-track yard that accommodates 56 cars." It's notably paltry coverage, especially given that the Times had two reporters in attendance. No mention is made, as the Times's CityRoom blog reported, of the complaint by board member Doreen Frasca: “It is one month shy of four years since the board accepted Forest City Ratner, and this committee is being given less than 48 hours to understand a complex transaction... I think that’s pretty outrageous." Nor does the Times report, either in print or on the CityRoom blog, that Forest City Ratner would save about $100 million on the "changed" railyard. Nor does the Times report, either in print or on the CityRoom blog, that the temporary railyard, which was once supposed to last 32 months after construction, could now last six years and eight months, or 80 months. It would have capacity for only 42 cars. No mention is made of the provision that Forest City could walk away from the requirement to build a new railyard by paying $86 million. Nor does the Times disclose, as it used to do, that the parent New York Times Company built the Times Tower in partnership with Forest City Ratner. The point of the disclosure is to alert the readers to take Times coverage of this developer with a grain of salt. And it should remind the Times's journalists to be exacting in their coverage of Forest City Ratner.